Our Quartz surfaces consist over 94% natural quartz, thus retaining the qualities of one of nature's strongest stones and at the same time offering freedom of design and endless application possibilities. Our Quartz is resistant to stains, scratches and cracks, it is impervious to heat and cold and requires minimal maintenance. Engineered Quartz material is being used more than ever these days for interior flooring in residences as well as commercial establishments. 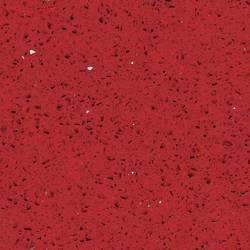 Our Quartz provides an excellent option to be used for internal wall covering application. Its hardness, non-porous nature and stain resistance makes it an ideal solution for covering bathroom walls and backsplash in kitchens. Crystal White Quartz is transparent, white crystal quartz countertop, with barely visible delicate patterns reminiscent of glinting light. 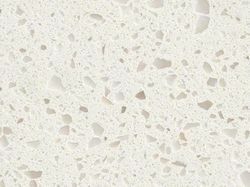 ... Of all white quartz countertops, Crystal White is the one that is maybe the best quartz countertop type for combining with other surfaces in a kitchen. 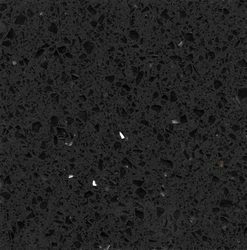 As intriguing as the night sky, Sparkling Black Quartz is a dramatic statement perfect for creating durable quartz countertops, backsplashes, accent walls, shower surrounds, and even floors. Available in 2 CM and 3 CM slabs as well as prefabricated sizes, this durable, easy-to-clean, low-maintenance, and stain-resistant quartz is perfect for bustling homes and commercial properties. The deep black background is punctuated by sparkles and highlights lending a sophistication and touch of glam to design projects in kitchens, bathrooms, entryways, mudrooms and laundry rooms, and outdoor kitchens. Durable, easy to clean, and virtually maintenance free, TSI IMPEX Gray Quartz is a premium surface well-suited for busy kitchens and baths. Sleek and elegant, TSI Gray's dark hues complement transitional, contemporary, and modern design styles. Invite this gorgeous gray into your space and create stunning quartz countertops, waterfall kitchen islands, backsplashes, accent walls, shower surrounds, and floors. It coordinates effortlessly with a wide range of wall tiles and floor tiles allowing you to create your own signature style. We are exports of Chilli red quartz slabs from India. 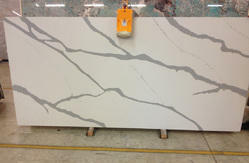 Our quartz slabs are avaialable in big gangsaw sizes. 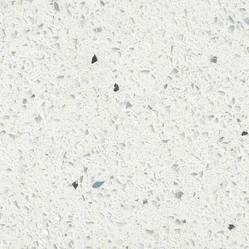 Calacatta White quartz is a stunning new addition to our quartz range. With its beautiful striking wide vein pattern and luxurious feel. This quartz offers the natural look of the Calacatta marble, but with none of the drawbacks that come with marble worktops. Calacatta quartz is a very durable worktop that is stain and scratch resistant meaning it is also a very practical choice. TOSHIBBA IMPEX Calacatta White quartz slabs with its clean whites and striking through-body veining. Perfect for creating show-stopping quartz countertops and waterfall islands in kitchens, bathroom vanity tops, backsplash, showers, and floors—in both residential and commercial environments—this lovely neutral quartz won’t let you down. Available in 2 CM and 3 CM slabs and prefabricated options, get the look of luxurious marble in this durable and maintenance-free quartz. We are regularly exporting Engineered Quartz slabs to USA, market. We produce prefabricated engineered quartz countertops, vanities & other specific designs too in our pre fab unit based in Himmatnagar, Gujarat. 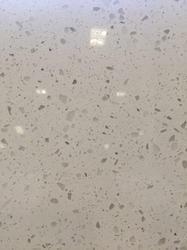 All of our engineered quartz surface products are made using up to 93% quartz (one of nature’s hardest minerals). The remainder is made from high-quality polymer resins and pigments that are compacted under intense vibration, vacuum, and pressure into dense, non-porous slabs. Our quartz counters are then gauged to precise thicknesses and polished to an enduring shine. This process results in surfaces that retain the cool, tactile qualities of natural stone while offering design freedom and almost unlimited application possibilities. With 3/4″ inch thickness, our prefab quartz countertops are made with strict compliance to USA Building Code. Our material quality is one of the best in the market, well-known for its lamination, polish, flatness, hardness, and straightness. Looking for Engineered Quartz stone slabs ?